Aftermarket front or rear off-road bumper is a great solution if you're looking to maximize the protection and functionality for your truck. Go Rhino BR Series steel bumpers are measured and designed in 3D CAD to form fit the contours of your truck. They are built of 3/16” thick steel and come with textured black powder coat finish. Depending on the model, you would be able to accommodate the winch and additional lighting. These bumpers also feature the angled designs allowing for additional ground clearance and easy, no-drill installation. Upgrade your Ford F-150 with Go Rhino BR Series Bumpers! 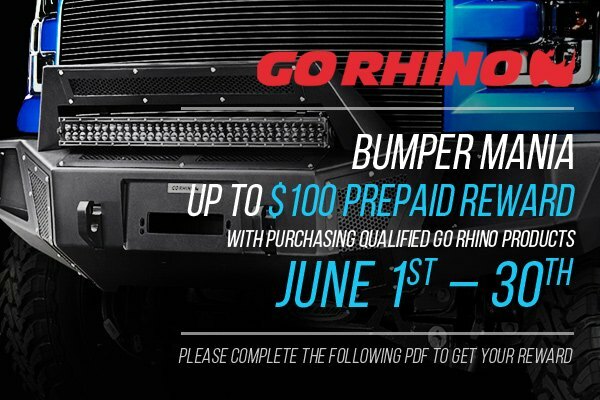 Purchase qualifying Go Rhino products and receive up to $100 Virtual Prepaid Mastercard. Rewards have never been easier to earn! Act now, this offer is valid through June 30, 2018. Please look at the PDF form and follow instructions to get your reward. Quick Reply: Protect the front and rear of your F150 with Go Rhino Bumpers + Promo!